There’s every reason for While She Sleeps to be on cloud nine at the minute. Not only are they almost midway through a tour on the cusp of completely selling out, but it arrives in the aftermath of their third album You Are We debuting in the Top 10 of the UK Album Chart. Just to reiterate – an independently released, politically charged metal album is amongst the ten biggest selling releases in the country. As if their fans’ dedication wasn’t enough already, the Arts Club is virtually packed from the off, even for openers Fizzy Blood (6), the undeniable odd-band-out of this bill. Their bass-led, groovy alt-rock is more in line with Pulled Apart By Horses and their ilk than anything close to metal, and while they could still use something a bit more tangibly captivating beyond bassist Ciaran Scanlon’s manic gurns and convulsions, there’s a distinct personality that shines brightly through. Maybe In Hearts Wake (4) should take some notes about that personality, but then again, what does one really expect from a B-tier Australian metalcore band with ties to UNFD? To their credit, there’s enough to commend them on to prevent their set being a total wash – their live mix has muscle and clarity, their visual display of various landscapes is interesting enough, and frontman Jake Taylor crowdsurfing on an inflatable crocodile during Survival (The Chariot) is at least a bit of fun. But really, they completely empty their bag of tricks during the first song and unsuccessfully try to replicate it every time. The breakdowns drop; the pit ignites; rinse and repeat for every song until banging your head on a wall becomes a viable alternative. Oh, and there’s the weak, over-earnest ballad Wildflower to fully hammer home how little this band really have by way of ideas. But as everyone knows, While She Sleeps (9) are in no danger of falling into that ballpark, as You Are We makes way for the unfolding carnage. And yes, this is a band who are currently at the crest of a very significant wave when it comes to heavy music, but comparing them in this environment to previous live shows displays a growth that can’t be ignored. This is the tightest While She Sleeps have ever been by a considerable distance, with the guitars able to slice through the new material’s more melodic bent just as exceptionally as the raging carnage of New World Torture, and Loz Taylor’s vocals having the most commanding presence they’ve ever had. The crux of the matter, however, comes in the actual songs, and it says a lot for the quality of their news output that the band can opt to occupy over half of the set with songs from that new album, and still see them greeted like classics already. 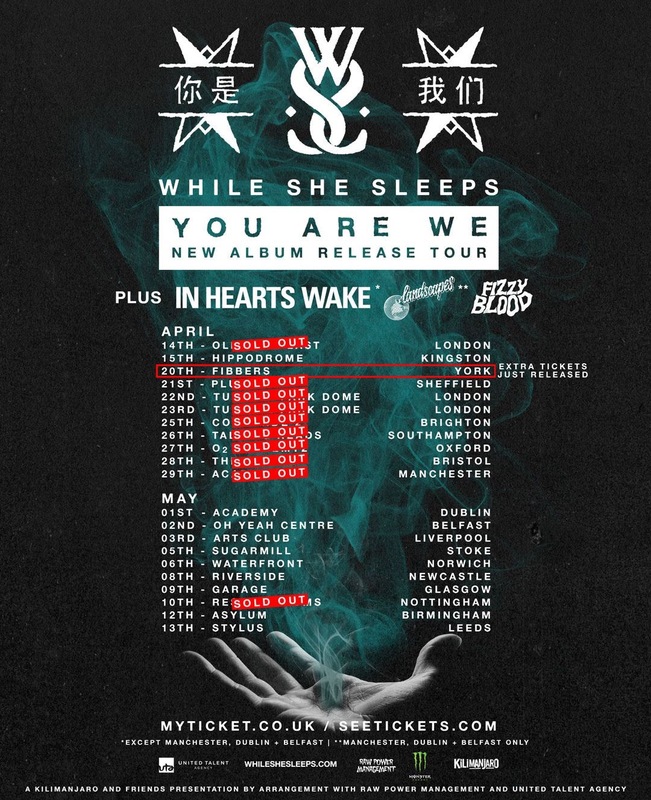 It’s hardly a surprise though, with the thunderous Civil Isolation setting off some fire nice and early, with Wide Awake and a colossal Silence Speaks putting in the work to make this era of While She Sleeps the best one yet. It’s also worth noting the lack of their more expansive numbers like Our Courage, Our Cancer, and it’s here where the band’s punk roots really begin to show. This is intended as a full-throttle ride from start to finish, and while they could easily occupy venues multiple times the size of this venue, this tour feels all about giving back to the fans who got them to this point. And at the end of the day, the fans are just as intrinsic to the whole experience as the band. It’s the whole message of ‘you are we’, and tonight, with a crowd as willing to give just as much as the band, the divide marked by the barrier feels virtually nonexistent. It’s a near-perfect connection between everyone in the room that couldn’t be more palpable, and as the final notes of Hurricane ring out, everyone can feel it too. This is While She Sleeps at the pinnacle of their abilities, bolstered by one dedicated extended family at their side. If that isn’t a recipe for success, then what is?